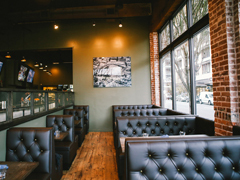 We build and upholster Booths for restaurants, Bar Stools, Benches, Chairs, Ottomans, Couch Cushions, and Pillows. We apply Fabric, Vinyl, and Leather on all our furniture. We have 12 different types of foam to choose from such as Polyurethane Commercial Foam, Latex Foam, Polyethylene Foam (Closed-Cell), Dry Fast Foam, and Memory Foam.